Banish stains and dullness to get your porcelain sparkling again with these gentle yet effective treatments. Maintaining a spotless porcelain sink will add charm and luster to your bathroom or kitchen—not to mention value to your home. This glass-based ceramic is fired at high temperatures, then used to coat a metal or cast iron base. Although the porcelain surface is non-porous, its glaze is susceptible to staining and daily wear and tear. 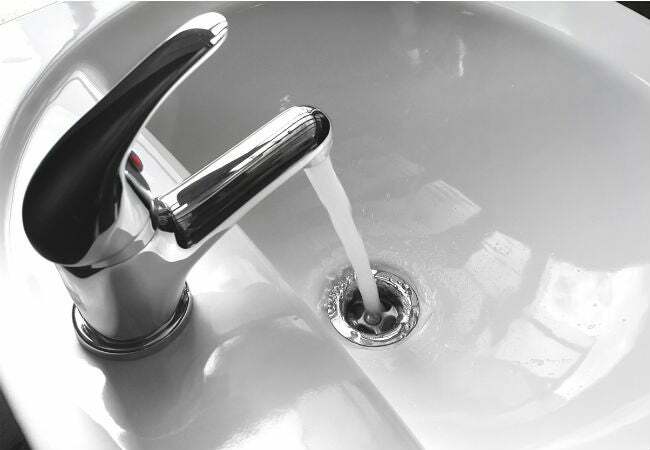 In bathrooms, porcelain sinks can dull over time, due to soap scum and water with a high mineral content. Rust stains are another problem, especially if your water contains higher levels of iron. Also, watch out for mishaps with hair dyes and nail polish—products containing chemicals that can harm or strip the finish off porcelain. In kitchens, food stains are the primary problem for porcelain, so clean up coffee grounds, tea bags, and food scraps promptly. Also be wary of placing silverware directly into the sink, as it can scuff and score the surface over time. For protection, place a soft dish mat or dish drainer into the basin. If you notice some staining despite these preventive measures, try the methods below for how to clean a porcelain sink, each one addressing a slightly more serious level of staining or scuffing with different products and techniques. If you have an antique or colored porcelain sink, use non-abrasive cleansers, avoid bleach, and contact the manufacturer or a plumber if you have any questions. The best rule of thumb: Don’t clean a porcelain sink with anything that would scratch glass. STEP 1: Gently clean with liquid soap and dry. 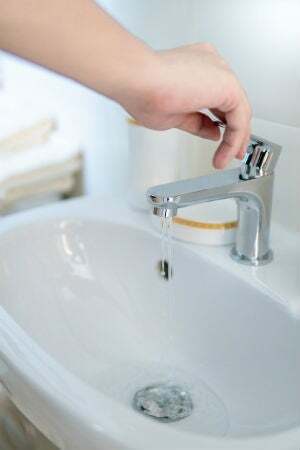 Using warm water, liquid soap, and a sponge, gently clean the porcelain sink. Remove any food, soap, or toothpaste build-up from the surface. This will allow you to identify any stains or scuff marks require a deeper clean. Wash away all soapy residue, and dry with a dish towel. STEP 2: Skip scrubbing, and remove discoloration using bleach on white porcelain and hydrogen peroxide on colored porcelain sinks. Harsh scrubbing can damage porcelain, so your first line of attack should be the least abrasive. For white porcelain only, bleach can be used to remove stains; never use chlorine bleach in colored or vintage porcelain, as it can damage the finish. For both white and colored porcelain, liquid oxygen bleach—such as hydrogen peroxide—is a good alternative. It may take longer to work, but it’s less caustic and more environmentally friendly. Pour the bleach product suited to your type of porcelain into a spray bottle. Cover your sink with a layer of paper towels. Spray bleach or oxygen bleach over the towels, allowing it to soak in thoroughly, and let sit for 30 minutes to an hour. Discard the bleachy paper towels, and rinse sink completely with clean water. If concerned about putting any kind of bleach on an antique porcelain sink, use white vinegar instead. Add undiluted white vinegar to a spray bottle and spray the sink, then use a non-abrasive sponge and circular motions to clean the porcelain. Rinse thoroughly with water. If the stains don’t lift completely and you decide to try oxygen bleach, remove all traces of vinegar first to avoid the harmful side effects of combining vinegar and bleach. STEP 3: Tackle deeper stains with a mild abrasive. If you don’t feel comfortable using bleach, try lifting stain with a gentle abrasive. Note that there are many abrasive cleansers on the market, and not all are designed for porcelain. One safe and effective liquid is Bar Keepers Friend (available at Walmart, $2.47 for 26 ounces). 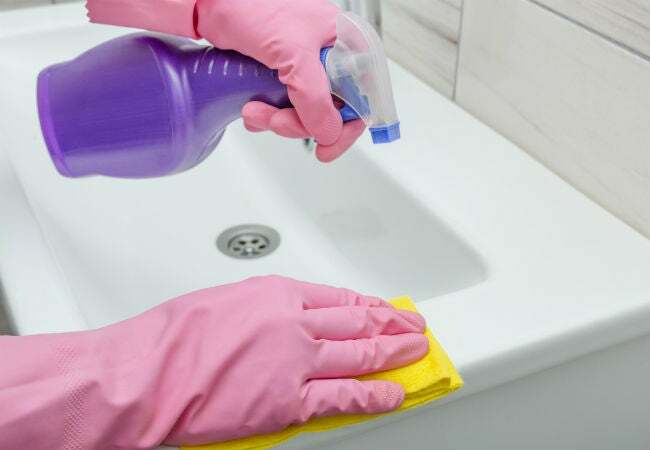 Squirt a small amount into the sink and gently scour the surface with a non-abrasive sponge. Its oxalic acid will lift stains, but be sure to use the product sparingly or risk discoloring and scratching your porcelain. Lift metal stains with a little bit of acid or naval jelly. Tackle silverware stains and orangey-red rust separately, using these methods. Add a few drops of either lemon juice or white vinegar directly to a metal stain—do not mix acids. Let dwell for several minutes, monitoring the color of the stain. Do not scrub. Remove with water. For rust stains, use naval jelly (available on Amazon, $7.29 for 16 ounces). Apply a thin coat to the stained area, monitor carefully, and rinse as soon as you notice a change in the color of the stain. Naval jelly is primarily used to remove rust from metal, so exercise caution and rinse it quickly from porcelain as soon as the stain lifts.